With 7 Khoon Maaf, director Vishal Bhardwaj returns for the second time to another Ruskin Bond short story Susanna’s Seven Husbands. His first was Blue Umbrella. The film is at one level a woman’s search for love. Bhardwaj makes this journey through the mind of Susanna Anna-Marie Johannes (Priyanka Chopra) – a woman who lives the world not in black and white, but in all its accompanying shades of grey. She veers at the precipice between sanity and insanity, almost willing herself back from the edge just as she threatens to veer over. This should have made for a promising premise in the hands of the director who created both Omkara and The Blue Umbrella. But this is not to be. Bhardwaj fails both in his interpretation of Bond’s original story and his subsequent execution. The problem begins when this very difficult story is told in documentary fashion, with linear progression. We watch the rising and ebbing of seven different love stories, knowing in advance that each of them will fail and end in murder. The first love story becomes the recipe for all that will follow. Missing is the element of speculation and curiosity essential to retain an audience’s interest in the film. The almost straight line progression of the compartmentalised love stories also does little to help Bhardwaj’s case. Strangely absent are the many layers to both the unusual story and the most interesting woman protagonist that Bhardwaj has given us till date. The single saving grace to this film could have been sparkling performances from a cast that includes Priyanka Chopra, Neil Nitin John Abraham, Irrfan Khan and Naseeruddin Shah. But while the latter three make interesting cameos, this is a film that rests squarely on Priyanka’s shoulders and she does not meet the challenge. She plays to script, but does not add new dimensions to arguably the most complex character that she has ever played. For Priyanka, it is an opportunity squandered. Equally disappointing is the portrayal of the woman as a victim in love, who loses herself in other world escapism. Contrast this with Hollywood productions like The Piano, where the woman protagonist rises above the waves enveloping her and demands for "life". The high point of the film remains the music from Vishal Bhardwaj. It captures the essence of the film where his direction fails. So it’s a rating of 2 stars for 7 Khoon Maaf. A woman’s heart is a complicated thing, and Bhardwaj’s most avid fans are not going to forgive him easily for treading past it very lightly. The ratings are on a scale of 1 to 5 and try to strike that difficult balance between cinematic critique and giving the regular film buff a peek into what’s playing in town and worth a watch. Will 50% women councillors in BBMP help Bengaluru? 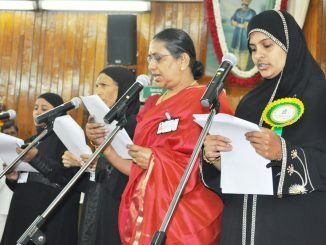 The Karnataka cabinet on 7th May announced 50% reservation for women in urban local bodies. Is this a political gimmick? A sea of plastic bags were sitting around, while all our children were playing in the driveway. An accidental wrong hit and and they would be scrambling amongst the garbage looking for their ball . Something had to be done. And fast. Many of the lifestyle related diseases are easily preventable. Early diagnosis can help prevent fatalities too. Here’s list of things you can do to ensure you stay ahead of life affecting diseases.